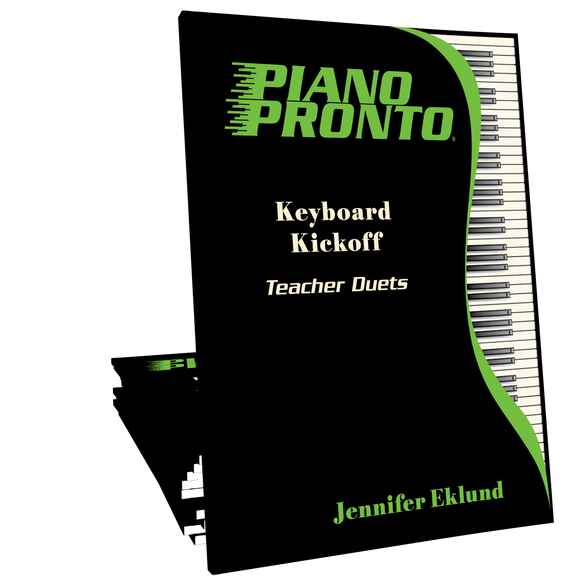 Teacher accompaniment parts for all 35 songs from the Piano Pronto Keyboard Kickoff method book by Jennifer Eklund. 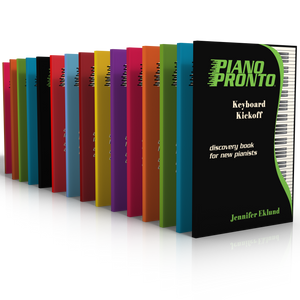 Fresh, contemporary duet parts for all 35 songs in the Piano Pronto Keyboard Kickoff method book! These duets will delight students of all ages and help to reinforce their rhythmic skills. Playing duets with students is an important part of my students’ lesson each week and having these beautiful teacher parts makes it so much fun fair both my students and me!! I love playing these duets with my students. The music is very lovely and my students enjoy hearing the big sound we make. Nothing better than making beautiful music with a child!! Jennifer Eklund's teacher duets are so much better than anything else on the market. The engaging rhythms and lush harmonies motivate my students to work hard on rhythm, tempo, and musicality. The final result is an exciting, rewarding performance for teacher and student. Parents love them, too! Right from the first lesson - I have smiles from students and parents. Everyone loves these duets! The music sounds so rich and full and from the teacher perspective - the duets are so much fun to play. Highly recommend to teachers to purchase this great duet book to play along with Keyboard Kickoff pieces. These are lovely! They strike a balance between readability for the teacher and excitement for the student. I love them for lessons and played one with a student in a recital who was floundering until we started in KK! I can't recommend these teacher duets enough! They make simple songs beginners can play, sound absolutely amazing! And they aren't your typical teacher duet part you find in other method books - these ones are truly a delight to play! And the students beam with such a look of accomplishment when they hear it put together with their part of the duet! I love using these duets because they are so much more interesting than the average teacher duet! I also especially like the clever introductions that often pull in quotes from related songs. It's fun to see if students recognize them, and they always enjoy the full sound when we play together. Hands down, the best teacher duets ever! They help students with continuity and steady beat, and they make everyone sound good. Yay! These duet arrangements to play with young/new students, are inventive, creative, and tremendous fun! Thank you, Jennifer, for yet another great product with music appealing for all ages. I love and adore all of Jennifer’s duets. Many other methods throw a nice sounding, simple duet at the bottom of about half of their pieces. 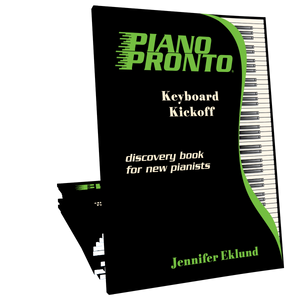 This book contains rich, full duets for every piece in the Kickoff book. These could easily be used in recitals with new beginners for a spectacular outcome! This is a must have. Awesome arrangement. My students and I really enjoy playing together. This also teach students ensemble skill from the very first lesson. I love this duet book. Most duets in other methods are pretty skimpy in sound and this book offers full-fledged duets that sound impressive. If you teach from Keyboard Kickoff you won’t want to miss this book! My students really enjoy playing along with me. This book has been a great addition to my studio. I have just started using this with one student and I really like the duet arrangements… especially (so far) for Mini Musette… Lovely Jennifer.